On this occasion, I thought I would continue our discussion of the Military Merit Cross by describing the first issue of the cross in detail. This is another example of the kinds of discussions we can have and will provide a chance to share information on this beautiful and historically significant award. The Military Merit Cross was established on October 24, 1849 and continued to be issued in this, its original form, until January 23, 1860. Before I describe this award let me provide some background information on its creation and some interesting facts about the award. Figure I, Alfred I Prince Windisch-Grätz. Image from author’s archive. Figure 2: Feldmarschall Joseph Wenzel Graf Radetzky von Radetz, Image from the author’s archive. 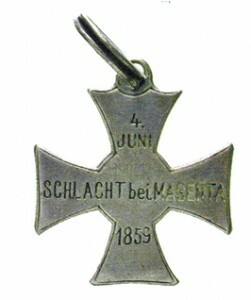 1859 = 862 crosses issued, 841 with war decoration after 1860. (14 of these crosses were issued posthumously, one retroactively and 3 to foreigners. This is the point in time when crosses could be issued for services rendered after 1849. Thus the large number of crosses issued in this year. 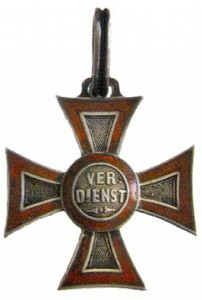 All crosses issued prior to 1874 (thus all of the crosses issued from 1849-1860) were to be returned to the War Ministry and later to the Privy Treasurer upon the death of the recipient. After 1874 the recipient’s family was allowed to keep the decoration. This practice is a major reason why these crosses are rare. Recipients of the cross, all of whom were officers were allowed to add “recipient of the MVK” to their names. 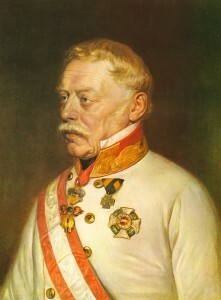 Some Notable recipients were: Feldmarschall Radetzky, Feldmarschall Archduke Albrecht, General of Cavalry Johann Freiherr von Appel, General of Cavalry Ludwig Prinz zu Windischgratz, Ludwig Ritter von Benedek. One last point before I commence describing the cross in detail and that is that the cross design was considered to be so attractive that it was the inspiration for the design of several later awards. Now I will describe the Military Merit Cross in an orderly fashion as I propose to do for other awards in the future. 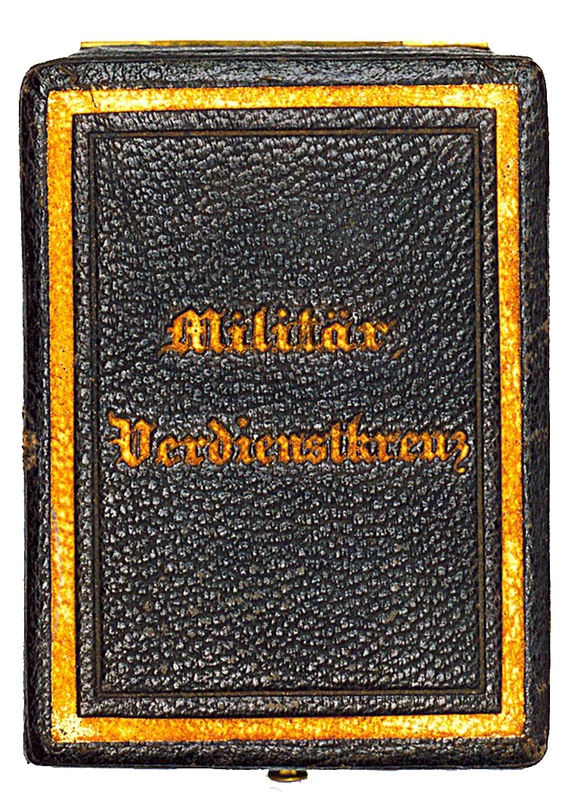 The decoration which was, at this time, issued in one class and type was issued to recognize officers of the Austrian armed forces who have accomplished especially meritorious services during time of war by high intelligence, courage and resoluteness, or in time of piece, by outstanding zeal. These badges are generally not hallmarked as the Austro-Hungarian regulations requiring hallmarks were not implemented until 1872. The overall design of the decoration was in the form of clawed cross suspended from a flat ornamental eye through which passes a 15 mm oval grooved ring which is 1.5 mm wide. 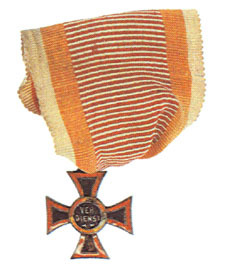 Figure 3: Military Merit Cross, Obverse, Image courtesy of Dorotheum. 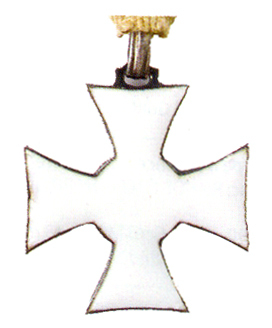 The reverse is plain silver for the official issued crosses and white enamel for privately made examples that were produced after 1855 (Figures 4&5). Figure 4: Type I Reverse. Image courtesy of Dorotheum. Figure 5: Type II Reverse. Image from the author’s archive. Note: The weight of the crosses may vary slightly based on the manufacturer. The cross is 30 mm in diameter. The arms of the cross are 15 mm in width at the end. The center medallion is 13 mm in diameter. The crosses are composed of silver and enamel. Type I: A cross as described above. 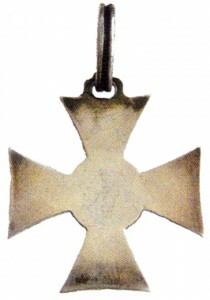 Type III: Similar to the Type I cross except the reverse of the cross has an inscription. These are presentation pieces. The inscriptions are privately added (Figure 6). Figure 6: Type III Reverse, Image from the author’s archive. The designer of the crosses is unknown to the author. Case: Since decorations were produced by more than one medalist there are probably more than one style case. One case used for these decorations is illustrated below in Figures 7 and 8. This case was used for crosses believed to have been produced by Rothe. 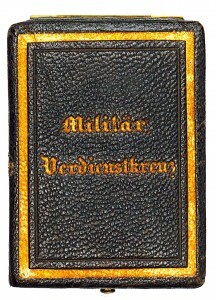 The exterior is in black leather or leatherette with trim on the edges and an inscription: Militär Verdienstkreuz, in Gold. The inside of the lid is in yellow silk. The inner portion of the lower part of the case is black velvet and fitted. Ribbon: The Ribbon for this award is as a 38 to 42 mm wide crimson and white laddered war ribbon worn initially as a straight ribbon and later as a tri-fold ribbon. The straight ribbon was worn suspended from a tunic button hole and the tri-fold ribbon on the left side of the chest (Figure 9). Figure 9: War Ribbon, Image from the author’s archive. There were no attachments issued for this award. Miniatures of this decoration exist. for an example please see Figure 10. 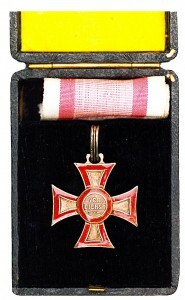 Figure 10: 1849 Military Merit Cross Miniature, Image from the author’s archive. If anyone knows who designed the Military Merit Cross I would love to hear from you.